Business owners are responsible for a large amount of corporate compliance filings. Our CorpWatch™ compliance helps you stay in compliance with state filing requirements saving you time and money. Our proprietary service monitors all of your entities in your client portal and notifies you of your annual report requirements based on your entity type, formation date, and fiscal year. Critical filing dates are pre-populated in our database with each entity order, you can also manually add additional entities to manage. CorpWatch allows you to mark events complete as well as review historical events. You can stop worrying about deadlines and stop paying for unnecessary penalties. Included with all of our packages - compliance and alert monitoring services which organizes state and compliance tax alerts for all your entities in our online client portal. 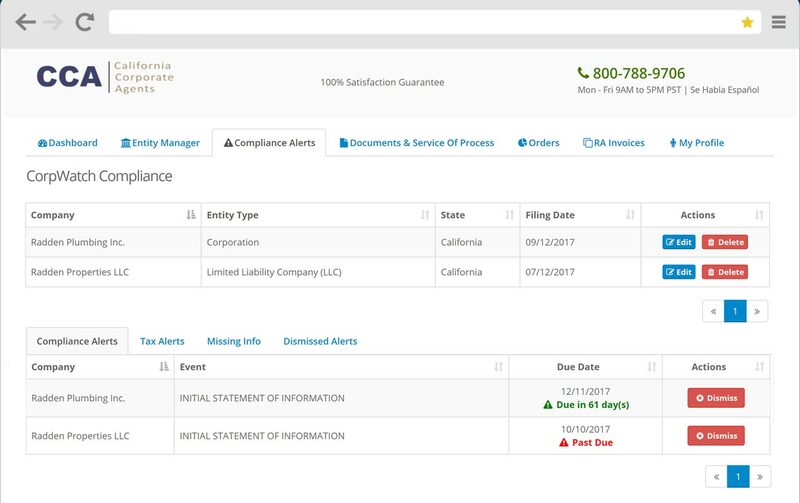 The client portal allows you to customize the alert notifications and includes advanced features for CPA's and Attorneys representing clients. We are Section 1505 certified by the California Secretary of State as an official registered agent provider.